Fourth-year outside linebacker Kareem Martin has impressed so far this preseason, producing three quarterback pressures on 31 pass-rushing snaps. Through three preseason games, he’s ranked 36th of 63 outside linebackers with a pass-rush productivity of 8.1, and he holds the second-highest pass-rush grade among all Cardinals players (78.6). With Jarvis Jones sidelined with a back injury, a door has opened for rookie outside linebacker Cap Capi, who has turned heads this August. 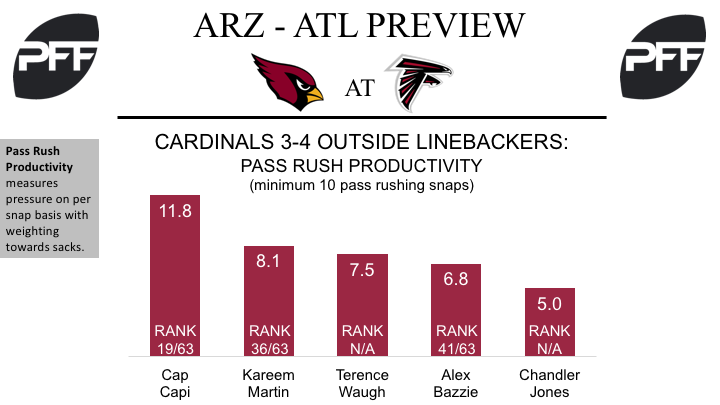 Capi has played the most pass-rush snaps of any Cardinal player (57) and produced nine total pressures, the second most among outside linebackers. Through three games, Capi has an elite pass-rush grade of 90.3, and is ranked 19th of 63 outside linebackers with a pass-rush productivity of 11.8. Tyrann Mathieu, S – Mathieu’s performance against the Chicago Bears was a reminder of the game-changing potential he has when he’s at 100 percent. Mathieu was all over the field on his 24 snaps against the Bears, and logged two tackles that resulted in an offensive failure. He was targeted three times in primary coverage, allowed negative-one yard, picked off a pass in the end zone and yielded a passer rating of just 30.6. Another strong showing against the Falcons would show that he’s fully free of the nagging knee injury that hindered his 2016 season. Justin Bethel, CB – Following an intense training camp battle with Brandon Williams over the number two cornerback spot, Bruce Arians named Bethel the starter this week, so he’ll want to repay the trust of his coaching staff. Bethel has been targeted twice in the preseason, allowed one reception for eight yards and yielded a passer rating of just 60.4 on throws into his primary coverage. John Wetzel, OG – With starting left guard Mike Iupati ruled out with a triceps injury, fifth-year offensive lineman John Wetzel will get the start in his absence. 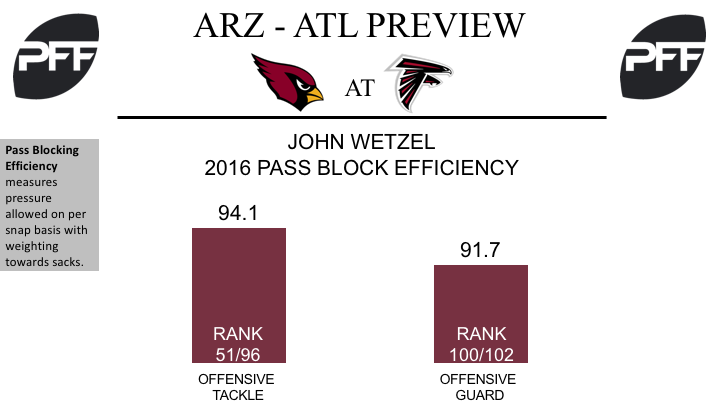 Wetzel has experience at both tackle and guard, but he performed much better at tackle last season. On his 290 pass blocking snaps at tackle, he achieved a pass-blocking efficiency of 94.1, which ranked 51st of 96 tackles with at least 75 pass blocking snaps. On his 81 snaps at guard, he achieved a pass blocking efficiency of 91.7, which ranked 100th of 102 players at the position. The battle between Ben Garland and Wes Schweitzer for the starting right guard position has been a close competition all preseason. Both have started one game in the first two weeks and both have played a similar amount of snaps. Garland: Started in the first preseason game, but played much better in the second preseason game despite coming into the game after Schweitzer. In last week’s game, Garland posted an overall grade of 79.8 compared to Schweitzer’s 71.5 grade. Schweitzer: Started last week against the Pittsburgh Steelers and although he had a slightly lower grade than Garland, he was able to improve on his 47.7 overall grade in week one. 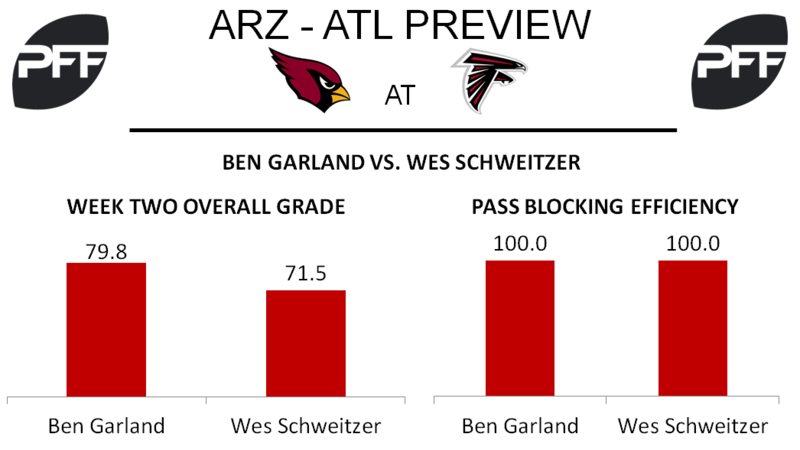 Both Schweitzer and Garland have posted a 100.0 pass blocking efficiency rating so far this preseason by allowing zero pressures each. Schweitzer has done so on 24 pass block snaps while Garland has posted the same on 23 pass block snaps. Julio Jones, WR- Jones has been limited all preseason after having surgery on his toe this past offseason. The All-Pro receiver reportedly might see some action in Saturday’s matchup against the Arizona Cardinals after being inactive for the first two preseason games. Last season, Jones led the NFL in yards per route run at 3.12. Terron Ward, RB- Fellow running back Devonta Freeman has already been ruled out for Week 3 while still nursing a concussion. In his absence, Ward has performed well in the running game posting, the ninth-most yards among running backs in the preseason on runs of fifteen or more yards with 42 of his 95 rushing yards coming on such runs. Takkarist McKinley, ED- The Falcons first-round pick in the 2017 draft made his preseason debut last week and performed well on just ten total snaps. McKinley has the highest pass-rush productivity of any 4-3 defensive ends in the preseason with three pressures on just seven pass-rush snaps.